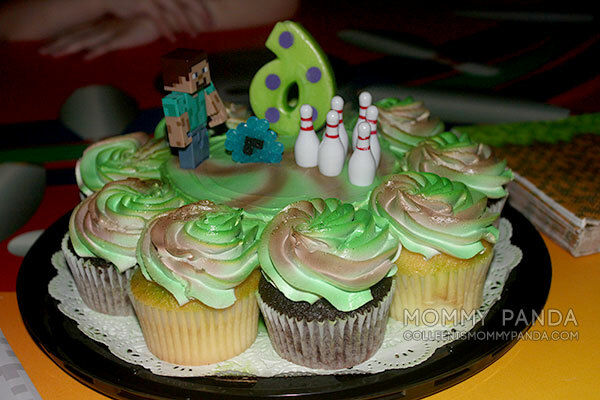 Originally, we were going to throw The Munchkin a Minecraft themed birthday party at home, as per usual, but a couple of weeks before we were going to have it, John suggested that we have it at a bowling alley. 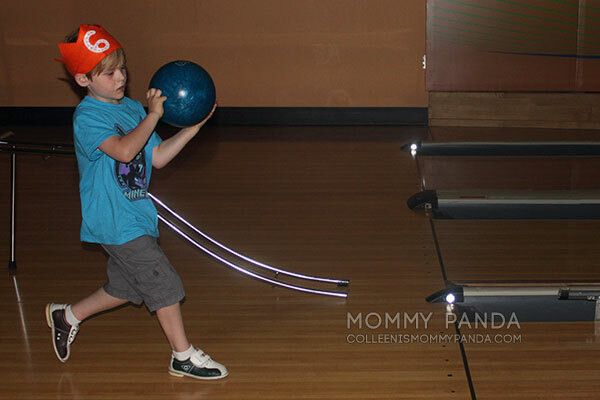 The Munchkin LOVES bowling, so there was no going back. 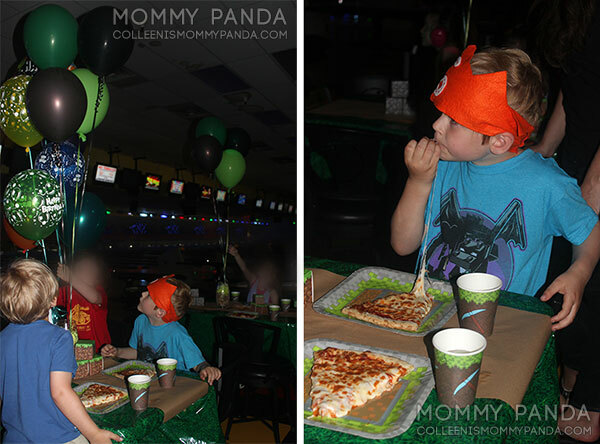 I had to have a Minecraft birthday party…at a bowling alley. 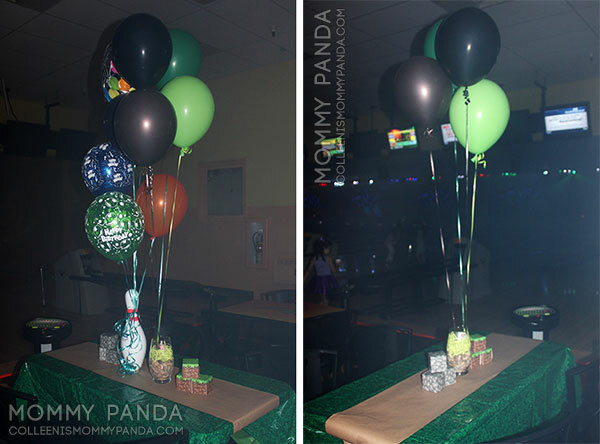 This gave me some difficulty because there’s not a whole lot one can do at a bowling alley in terms of a themed party. I can’t hang anything up, can’t really make activities since everyone is there to bowl… I was basically stuck with table-related goodies to define my theme. Luckily, Discount Party Supplies sent me some great Minecraft er um, “Miner” themed items that I ended up using! We invited some friends that we actually met when we were stationed at Fort Riley, who also moved up here as their next duty station (What are the odds?! 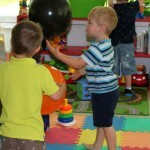 ), as well as one of The Munchkin’s friends from school. John and Mr. KS-friend took charge of the bowling aspect; setting up the names, figuring out the teams, and wrangling all of the kids. It was awesome. It was so (so so so) nice to actually sit back and just talk to the moms. So good. Eventually, the pizza came and everyone was ecstatic. 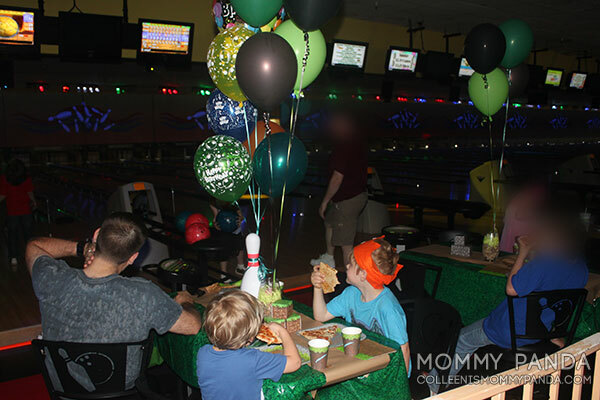 We chose a non-meal time to have the party, so I wasn’t sure if people would actually want to eat, but I guess bowling burns a lot of calories when you’re little! Those kids scarfed up the pizza in between their turns like it was their first meal of the day… at 4pm! I guess it was an early dinner? 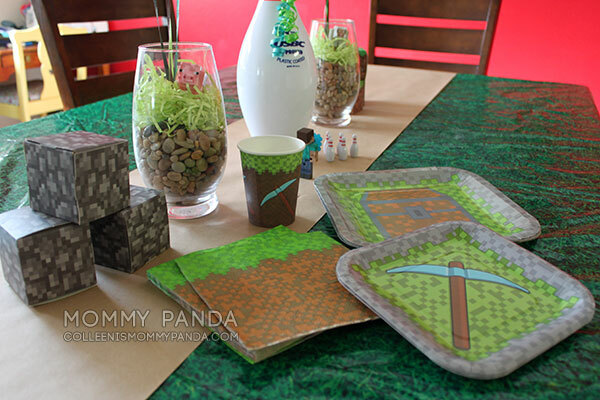 The set from Discount Party Supplies came with stuff for 16 people: two table cloths (Which are actually pixelated real grass…not sure why they didn’t do Minecraft-style block grass…), cups, napkins, and two different sized plates; one for the meal and the other for the cake. I ended up adding a craft paper table runner because I love table runners (And wanted to break up all of that green! ), and the best thing I could think of for a Minecraft themed centerpiece; which I have better pictures of towards the end of this entry. Turns out a bowling alley during disco bowling isn’t the best place to take photos in. SHOCKING! PS: The bowling alley gave us the bowling pin and the balloons attached to it. They actually gave us table cloths and plates and stuff as well, but a plain birthday party??? Pffft. I can’t have that! After pizza was cake, of course. Turns out, in the same way that Minecraft party supplies are only available online, it is not possible to go to a store and buy a Minecraft cake unless you want some kind of image printed on the cake. So, I had to improvise. 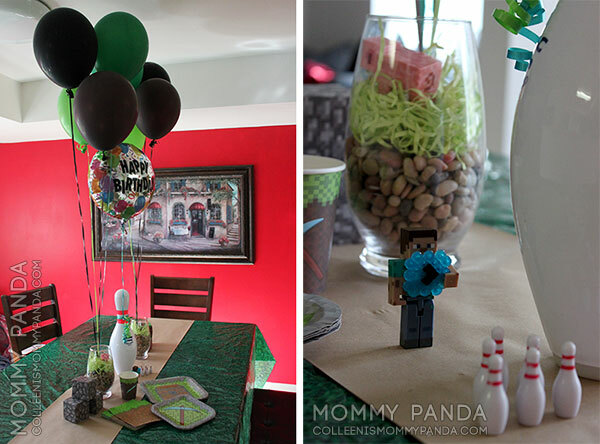 I made a cake topper scene out of a little Steve figure that The Munchkin got for his birthday, some bowling pins that Santa put in his stocking, and something that we’ll just call a “pixelated bowling ball” that I made out of Pearler beads. Then, I stuck it on top of a cake/cupcake combo that I bought at the commissary. Easy. 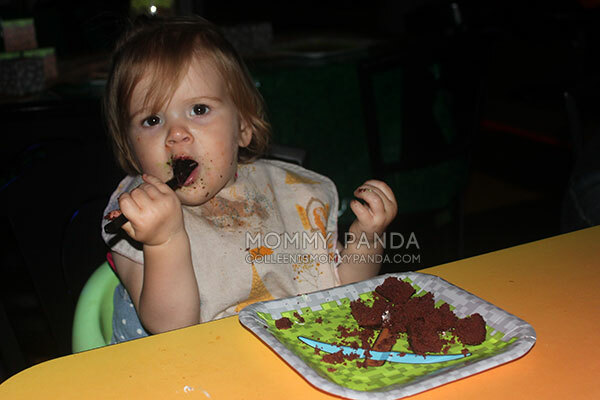 The Munchkin LOVED it! He was like “Woah! Is that STEVE?! BOWLING?! On my birthday cake? !” I mean, look at that enthusiasm. You can’t make that up. Overall it was a really great party. Good friends, good times, and I didn’t have to clean up afterwards!!! Side note: I’m pretty amused that The Munchkin and I are Team Minecraft, while The Bean and John are repping Team Captain America, I guess? Lil’ Miss is neutral at this point. Speaking of, here is a gratuitous Lil’ Miss picture, because there hasn’t been enough of her in this post. Look how big she is now! When we got home, I set up the goodies on the table since the balloons were still floating and I’m not one to waste cute party decor. Plus, the lighting was much better. I will say though, that bowling Steve didn’t last long on the table because the boys kept playing with him and I finally was like “ENOUGH STOP!” and put it away, haha. Here is a better picture of the stuff that came in the party kit. (Table cloth, cups, napkins, plates x2.) Everything worked well and people thought they were really cool. The only thing I thought could be improved was the thickness of the cups. Don’t get me wrong, they didn’t leak, but the party was something like three hours long (I knoooowww!) and by the end of it, those cups were feeling super flimsy when I picked them up. I’m not sure how they’d hold out for a longer period of time. Other than that and the pattern of the table cloth though, great stuff! 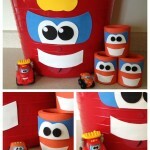 Here are some closeups of the centerpieces I made for the tables. I tied the balloons’ ribbons to a couple of rocks from outside, put them in glass containers, and covered the rocks/ribbon with brown fish tank rocks. Then, I dug out some green paper grass from my Easter decorations storage bin and put it on top. I wanted it to look like a block of Minecraft grass and was pretty happy with the end result. I thought that was going to be it for the containers, but the boys immediately came over and added the animals. It was the perfect finishing touch. Heart eye emojis all over the place. I added some paper blocks that came in a kit The Munchkin got for Christmas, and voila! 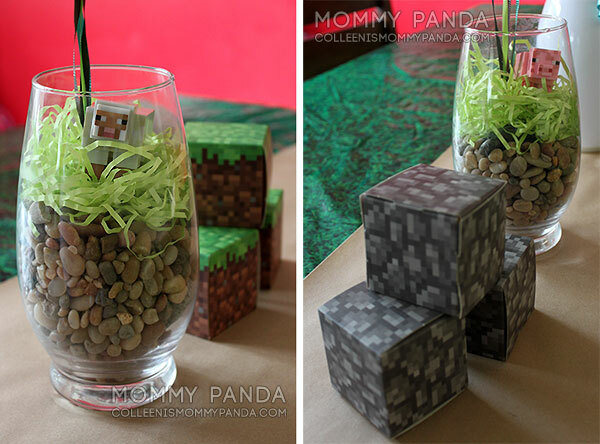 Simple, but effective Minecraft tablescape! 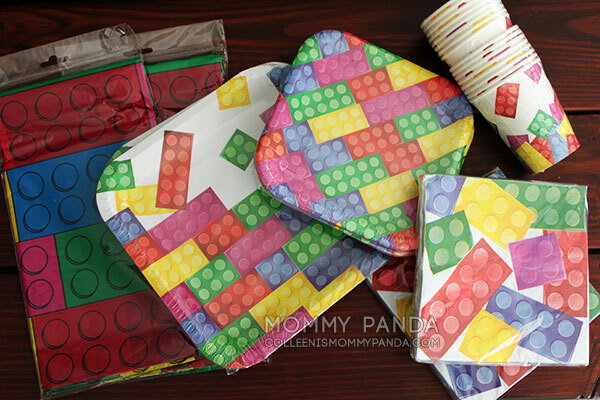 Before I go, I wanted to give you a quick sneak peek at The Bean’s birthday party theme… Discount Party Supplies was awesome enough to also send some Lego “Brick” party themed items! Aren’t they cool? 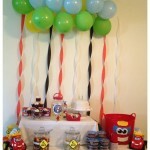 The Bean’s party won’t be until next month, but I can’t wait to blog about it! I sure do love me some themed parties. 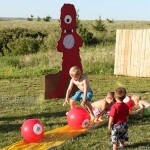 This post was sponsored by Discount Party Supplies, who gave us party kits for the boys’ parties in exchange for this post. However, opinions are 100% my own. This entry was posted in 1. 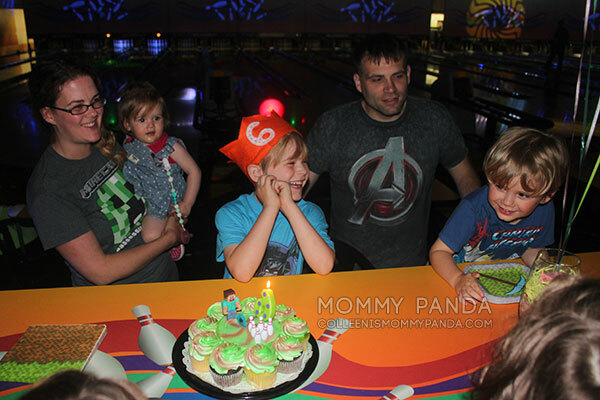 JBER (AK) and tagged birthday party, milestones, reviews, sponsored post. I like to order during non-meal time too, because the order seems to have more toppings!